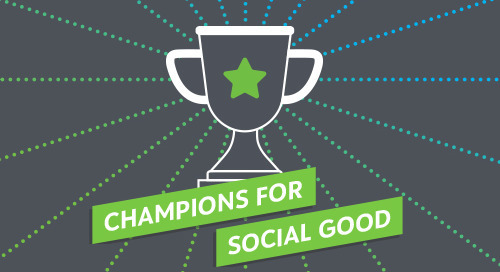 In this episode of the Champions for Social Good podcast, Rachel Hutchisson (@RachelHutchssn), vice president of Corporate Citizenship and Philanthropy at Blackbaud (@blackbaud), speaks with Darrin Goss (@DGoss_CCF‏), president and CEO of the Coastal Community Foundation (@CCFofSC), about social media activism, community engagement and more. Rachel and Darrin start off by discussing the biggest threat to doing social good right now, and the need for social media activism to be supported by on-the-ground support of local organizations changing policies. Darrin explains the difference between weak tie and strong tie activism – “weak tie activism” being defined by social media channels providing information and engaging people around causes they might not be directly impacted by, and “strong tie activism” including deep local involvement on the ground working to impact lasting change – and how both come together to create movements. Darrin gives an example of how weak tie and strong tie activism both played important parts in the sit-ins during the civil rights movement, and talks about how both are fundamentally needed to advance change today. Darrin and Rachel also talk about how organizations can leverage philanthropic capital to impact their communities, and how social, moral, intellectual and reputational capital are all key parts of a philanthropic organization’s ability to make a difference and influence others beyond just their financial capital. Darrin and Rachel also discuss the challenges faced by the Coastal Community Foundation, how it has embraced a bold new direction marked by a culture of courage, and how the organization has “turned outward” to directly engage the communities it serves in problem solving. Don’t miss an episode! Subscribe to the Champions for Social Good Podcast on iTunes, Google Play Music, Stitcher or your favorite podcast player.